For sixty years, Jewish refugees and their descendants have prospered in the Federal District of Sitka, a “temporary” safe haven created in the wake of revelations of the Holocaust and the shocking 1948 collapse of the fledgling state of Israel. Proud, grateful, and longing to be American, the Jews of the Sitka District have created their own little world in the Alaskan panhandle, a vibrant, gritty, soulful, and complex frontier city that moves to the music of Yiddish. For sixty years they have been left alone, neglected and half-forgotten in a backwater of history. Now the District is set to revert to Alaskan control, and their dream is coming to an end: once again the tides of history threaten to sweep them up and carry them off into the unknown. But homicide detective Meyer Landsman of the District Police has enough problems without worrying about the upcoming Reversion. His life is a shambles, his marriage a wreck, his career a disaster. He and his half-Tlingit partner, Berko Shemets, can’t catch a break in any of their outstanding cases. Landsman’s new supervisor is the love of his life—and also his worst nightmare. And in the cheap hotel where he has washed up, someone has just committed a murder—right under Landsman’s nose. A way to spend the last months of your peaceful American dream, right? Have I ever mentioned that I am fully prepared to forgive a book a lot if the narration features the right sense of humour? Well, this is a perfect example. Apparently the premise of The Yiddish Policemen’s Union is anything but original – I am the first to admit it. It starts in a fictional state of Alaska, a temporary home of the Jewish Diaspora, with a murder of a young drug addict committed in a sad, run-down hotel. A heavily drinking, depressed cop staying in the same fleabag hotel is called in. That cop, Meyer Landsman, will try his best to solve the case, perhaps the last case in his career or, indeed, life. He feels he owes that much to the unknown companion of his misery. The investigation will put him in contact with a fundamentalist Jewish mafia boss, a failed Messiah, the so-called tzaddik ha-Dor and his ex-wife, among many others. Nothing original, right? And yet I couldn’t stop reading and was chuckling every two-three pages, sometimes laughing out loud like a mad hag. Yes, it is a dystopia with terminally flawed characters and a lot of violence, very noir at times. Yes, the title hardly reflects the content. Yes, the author has an annoying tendency to ask different political questions in the middle of things (like what would happen if Zionists had botched things in Israel and instead found themselves in Alaska, disputing land with Native Americans, dreaming up terrorist plots to win back the holy land?). Yes, Chabon’s descriptive language and inventive style might distract you sometimes from the plot. No, the book doesn’t pass the Bechdel test although it features some well-rounded, warm-blooded female characters, Bina Gelbfish-Landsman, the ex-wife of our detective and a police officer, among them. Yes, magical/supernatural elements are barely there and I don’t think the novel can be qualified as a sci-fi position, not really. And yet I recommend it wholeheartedly, especially if you need a laugh or two and you appreciate the darker sense of humour. Finally: one brilliant book – the first this year I suppose. 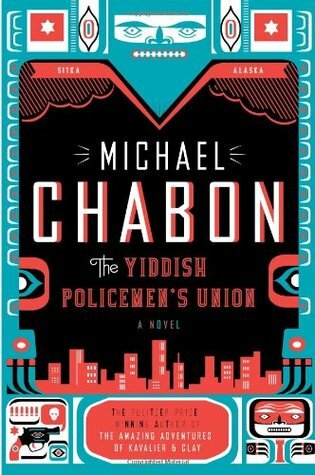 This entry was posted in alternate history, book review, contemporary, crime, dystopia, one brilliant book, rating and tagged a great sense of humour, a great story, chess, male main lead, Michael Chabon, one brilliant book, the yiddish policemen's union. Bookmark the permalink. Look at the link provided below my review :). Sure, read more. 😀 don’t worry, might happen to the best of us! Yayy! I’m glad it was brilliant. It certainly does sound good. It was :). I needed a good book so badly.